The KSA, Gauteng is looking forward to bringing you their first Industry Showcase in collaboration with ProQuartz, National Edging, Roco Furniture Fittings, Morrells Woodfinishes Africa, Maxima Software, Mactool, Dezign-A-Door and Niemann SA. 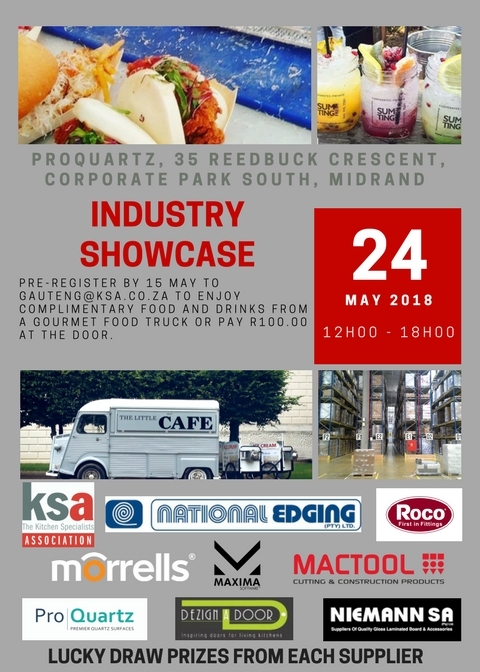 It is going to be a great opportunity to meet and mingle with the industry suppliers and there will also be a gourmet food truck, drinks, lucky draw prizes and music. We look forward to seeing you there.